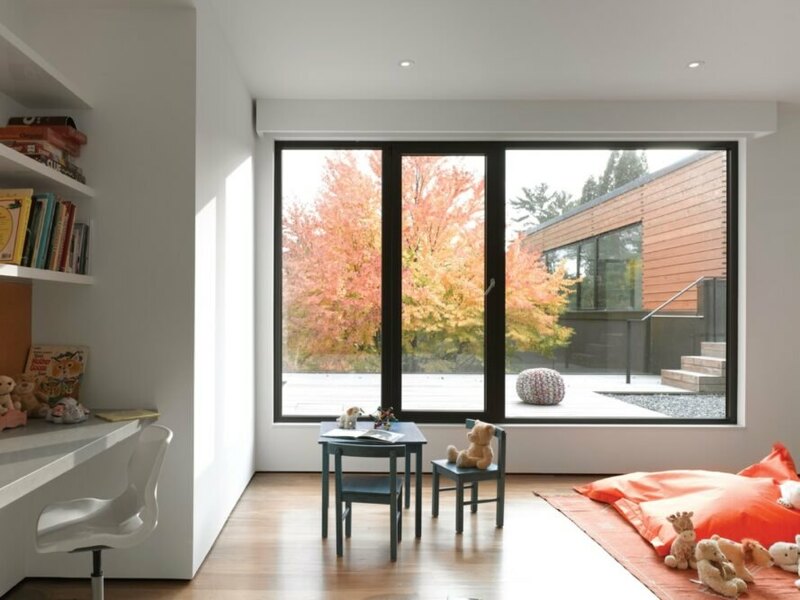 Blending East Asian and Western influences to reflect the client’s Asian-Canadian background, the Echo House is an elegant renovation and expansion project that follows ecologically sustainable principles. 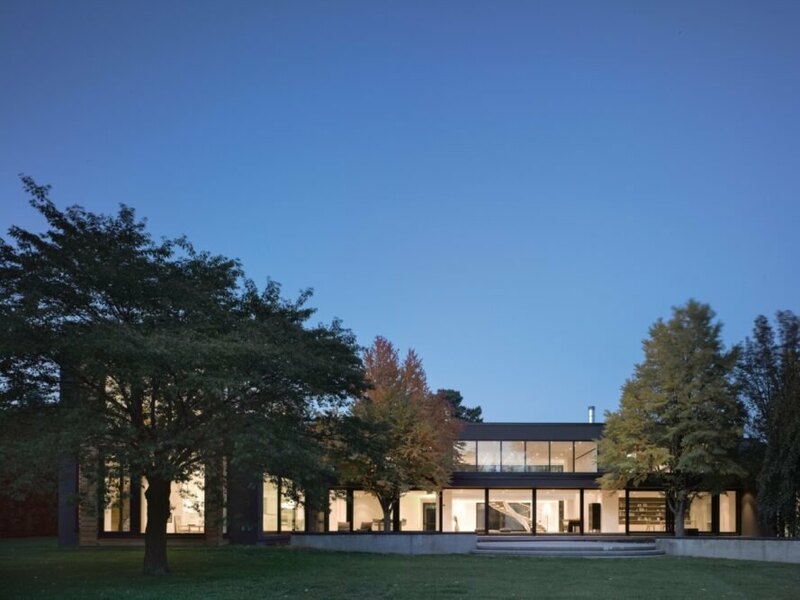 Designed by local architecture firm Paul Raff Studio, the home, which covers an expansive area of 11,140 square feet, is set on a two-acre property in the Bridle Path neighborhood of Toronto, Canada. Improvements to the existing structure as well as new high-efficiency heating, cooling and ventilation systems have led to over 50 percent savings in the home’s energy consumption. Inspired by the “eastern philosophy of harmony with nature,” the Echo House was designed with strong connections to the environment. Large full-height glazing, open spaces and optimized views of the outdoors strengthen these bonds, while strategically placed openings allow cooling cross breezes and sounds of birdsong to filter through the interior. Garden views were of particular importance and are articulated by walls of glass and huge sliding doors that completely open up the garden-facing side of the home, creating a seamless indoor-outdoor living space. “The name Echo House originates from its design aspirations and listening: be it the echo of birdsong or trees rustling in the wind,” Paul Raff Studio shared in a statement. “The homeowners say, ‘It is an expansive house, but almost all the spaces in it are intimate in size, and they all lead to the living room. It is like a sanctuary at the center of the house.’” The large living spaces were important to the clients, a cosmopolitan family that loves to cook, entertain and host large family gatherings. Ecological sustainability was also important for the homeowner and architects. Consequently, the renovated building exterior has been sheathed in a very high-performance insulation envelope, while new energy-efficient systems have greatly lowered the home’s energy consumption. Reclaimed Douglas fir was used for the Korean art-inspired exterior wood screens that give the house a sculptural effect. Paul Raff Studio designed this energy-efficient home. The house boasts more than 50 percent energy savings. The structure sits on a two-acre property. The interior design is rather minimalist with a blend of East Asian and Western influences. Each room is designed to connect with nature. A large kitchen is ideal for preparing delicious meals. Family and friends can gather here to enjoy meals. The homeowners can wake up to views of the outdoors. A modern bathroom imitates a spa. A look at the swimming pool. Sustainability was important to the clients and the architects. An outdoor deck affords beautiful views of the surroundings.